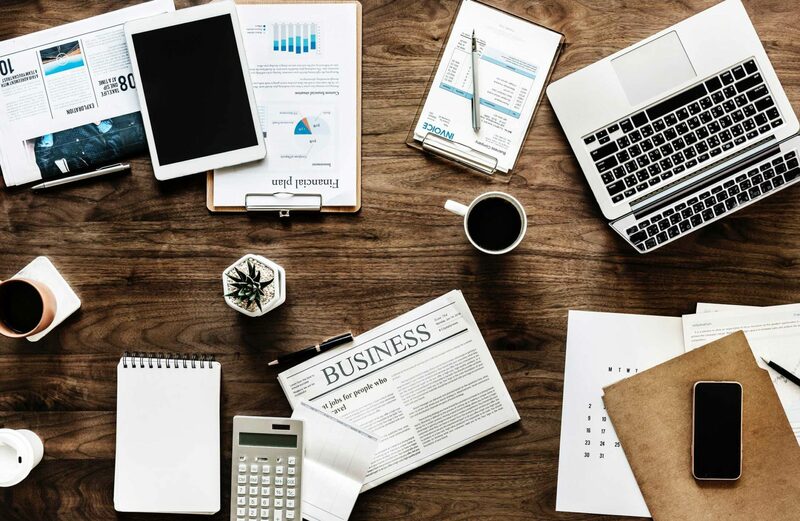 In the past, companies have marketed themselves to potential employees by honing in on one aspect of what’s called the “psychological contract” (the unspoken agreement between employers and employees). When employers keep up their end of the deal, teams are invested and motivated, but when they don’t, employee performance drops and teams become jaded and dissatisfied. These days, businesses can’t just brand themselves around one tenet of the psychological contract like career building, because in 2018, employees want a workplace that ties in more than one of these tenets. The HR team at Facebook recently wrote an article with Adam Grant for the Harvard Business Review where they identified these tenets (or buckets) as career, community, and cause. The psychological contract’s “buckets” address an employee’s core emotional needs: motivation, belonging, and pride. When people work in careers where they’re challenged, bettered, and respected – where they can grow, evolve, and flourish – they’re motivated. When people walk in to the office and know that they’re a valued part of the community, when they feel recognized and supported, when they feel like their colleagues are friends, they’re need for belonging is met. Lastly, when people connect with a business’ core values and goals, when they believe that the work they do has real, tangible meaning, they’re proud of the work they do. And despite the generational differences in the workforce (Millennials, Baby Boomers, Gen Xers), everyone essentially wants these same things. Ultimately, they don’t want to be bored, they want to belong, and they want a work culture that aligns with their values and purpose. The most engaging workspaces “authentically reflect their company’s brand and cultural values, and are conducive to the types of behaviors and activities that support the business.” That said, designing your workspace around your team’s emotional and functional needs will help you to recruit, motivate, and retain the best talent. What that looks like is entirely dependent on your business model, brand, workforce, and, of course, the actual work your team is doing. Addressing your employees’ needs effectively is directly related to their workspace. Currently, business leaders like Apple, Google, and IBM are redesigning their offices to promote human interaction – getting people out of their bubbles (remote offices, private offices) and bringing them together. Not only does this strategy encourage camaraderie but it also promotes collaboration and brainstorming. As John Donne said, “No man is an island” – conversation and friendships at work are proven to increase productivity, performance, and job satisfaction. 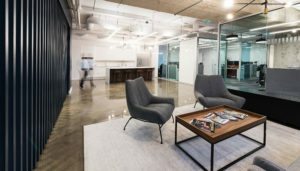 So even more traditionally segregated workplaces like law firms, engineering firms, construction firms where private offices and meeting rooms are the norm are moving toward innovative spaces. 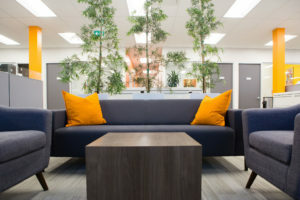 While collaborative and innovative spaces are the trend, your office design should reflect your business and its values. The first step, then, in an office design or redesign is evaluating how you do business, how you want to do business, what your values are, and most importantly, what your employees want. Including their input and ideas in your brainstorming and preconstruction process is an excellent way to encourage engagement while also showing them that their opinions, needs, and ideas matter. If you are interested in learning more about our design build services simply fill in the form below and our team will be in touch with you shortly.